At Hotels VIVA, we want you to feel at ease every moment of the day. And what is the most fundamental of all human pleasures? Food, of course. Without a doubt, you’ll remember the array of food on offer after your stay at the Aparthotel VIVA Blue & Spa. That’s because our restaurants always astonish our guests with their quality and variety. Of course, we also take special care of children and athletes, who will find dishes adapted to their personal tastes and requirements. Imagine strolling past counters stocked to the brim with delicious food. That’s what our buffet is like. From the early hours of the morning, we’re prepared to offer you anything you might fancy - from an energetic, healthy breakfast or one full of sweet treats. The choice is completely up to you! When it’s time for dinner, visit our Show Cooking stations; ENERGY, with salads and fresh products. GOURMET, with meats and fish cooked to your liking. Everything is freshly cooked! You’ll be constantly surprised by our buffet. We organise themed dinners on a weekly basis, with Mallorcan, Japanese or Mexican cuisine. They are a lot of fun! And, of course, there’s always a variety of top-quality dishes available. Find a special moment to share with your partner. Whether it’s gazing into each other’s eyes, a few shared laughs or talking until the sun comes up. We’ll provide the music and the drinks: cocktails, long drinks, champagne or liqueurs. It’s up to you. 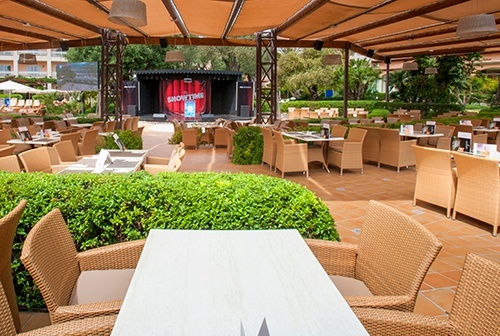 When night falls, enjoy live entertainment, such as the piano, singing, comedy or Spanish dance performances. 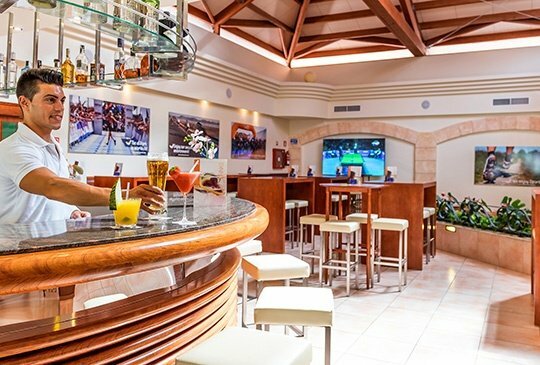 Whatever happens at the Lounge Bar, stays at the Lounge Bar. At our Sport Bar you’ll be able to watch your favourite team play or explore the galaxy from the comfort of your PlayStation. Make the most of the night – you’re on holiday! Discover the flavour of the Mediterranean. We’ll serve it to you on a tray. Our restaurant is a fusion of cultures and cuisines: Italian, Greek, Moroccan and Spanish. Flavours from here and everywhere. Eggs with Spanish cured ham, gazpacho, garden salads and couscous. Delicious pasta and pizzas for all tastes, with salmon, cream cheese, chicken kebab and dates, and curry and basil flavours. Ask for the Mallorquina pizza with sobrassada and honey. Wow! Sample the meats topped with spices and sautéed vegetables, or try the Greek- or Arab-style fish. There’s also a special menu for vegans and vegetarians. Who’s hungry? Do you like to lie in when you’re on holiday? Is your favourite place to be on a sun lounger next to the pool? And when it’s time for dinner, do you fancy a quick snack while you carry on relaxing? EL PATIO is the restaurant you’re looking for! You can enjoy coffee and soft drinks at any time. You’ll find delicious treats on its menu featuring salads, meats and pizzas. At night time it becomes a restaurant where you can tuck into delicious grilled meats on the hotel’s central terrace. Check out the stars! You can now enjoy delicious snacks next to the pool. We have completely reinvented the idea of a pool bar. 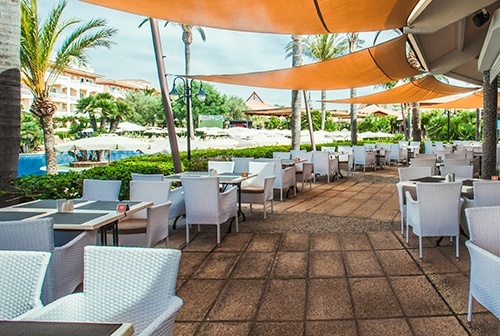 Cool off with some delicious drinks; including cocktails, long drinks, aperitifs, smoothies, and frappés. Plus a healthy selection of beer and wine. But we still have even more to offer! 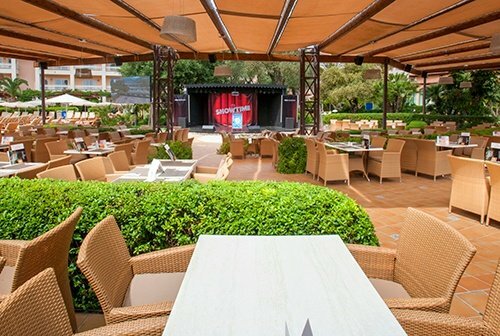 You can sample à la carte dishes at our Pool Bars: healthy salads, pa amb oli, tartar, pizzas, meats and fish. Now that’s true living! In addition to delicious, it’s fun. This is how you eat breakfast, eat or have dinner at VIVA Hotels. The little ones enjoy our most special attention. We prepare dishes adapted to your tastes and nutritional needs, loaded with energy and healthy proteins. The juices, bread, pasta and desserts have no secrets for us and that's why our menus are finger-licking. They have many flavors to choose from, they sure want to repeat !. We cheer up your tables with plates and cutlery full of color, easy to handle and safe. We dedicate spaces to play and enjoy a fun desktop. Being a child is very important in Hotels VIVA. 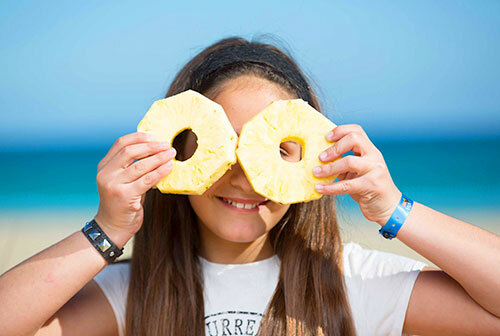 A holiday in Mallorca with All Inclusive for the most gourmets. 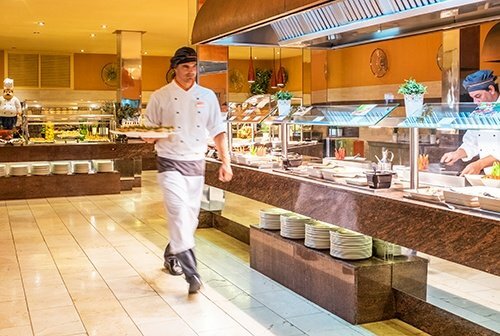 Breakfast, lunch and dinner at the Caprice buffet restaurant with self-service. Try our daily themed dinners (starting in April); Mallorcan, Mexican, Italian, Asian, Mediterranean, gala and international. To enjoy! If you stay 5 days or more, we give you an excursion in a tourist bus so you can get to know Playa de Muro and the beautiful surroundings of the hotel. You're going to love it! Enjoy a complete and high quality All Inclusive service!